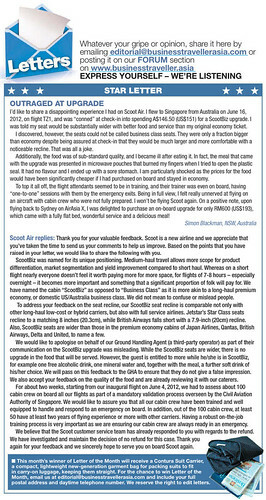 The article (click on the image right for a full size copy) on the right is an extract from the October 2012 issue of the Business Traveller Magazine (Asia-Pacific Edition) which I am a subscriber. Over the years, low-cost carriers (LCC) like Tiger Airways have been receiving negative press for their less-than-satisfactory flying experience. I, for one, can attest to that. I hated it. Won't fly them again. Ever. 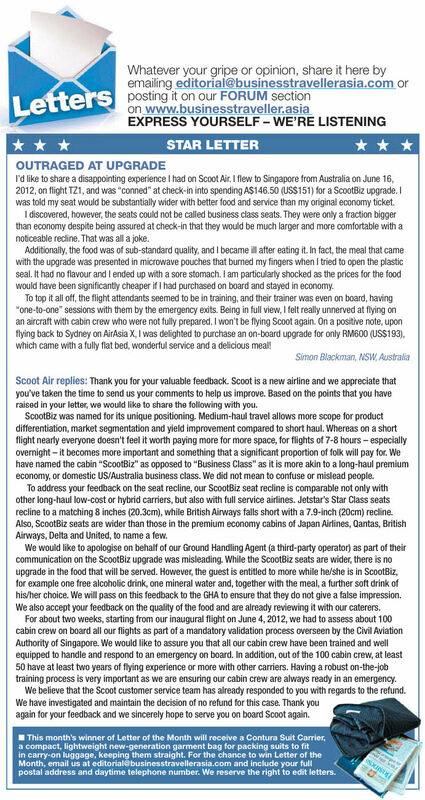 After reading the article on the right, I doubt if I am going to try Scoot Air, if I can help it. Granted that I fly full-service carrier (FSC) almost exclusively but there will be that odd occasion where I will need to drop a notch to LCC. I have to say not all LCCs are bad. I have some very good experiences with some LCCs like Southwest Airlines and AirAsia (See letter of commendation below). Silkair? That is a category on its own otherwise known as ripoff category. My last experience was a few years ago when I book via SQ's website, thinking I was going to fly via Singapore Airlines to ShenZhen. Lo and behold when I got to the boarding gate, I saw a Silkair Airbus parked there. As I found out later, both Silkair and SQ's websites published the same fare for that sector. Expensive lesson learnt that day. To classify Silkair as an LCC, it would be a blatantly expensive fare. To classify it as a FSC, the whole flying experience falls short of what I would expect of SQ which I felt I am entitled to, since I am paying the same price. No? So my advice to Mr Blackman of NSW, Australia, stick to FSC or throw all expectations out of the window if still insist on boarding an LCC flight.